Home / Magento / Why are my Magento products not showing up?! It prompted me to begin a sequence of steps I have found myself often taking to diagnose why products do not appear on the Magento frontend like I expect them to. I thought it might be worth documenting those steps I take and things I check to find out what is preventing a product to show up. Ironically yesterday, I got to the end of my usual list and the products still didn’t show up! So I now have one other thing to suggest you try when products appear to inexplicably stop displaying. Again another easy one to miss when adding a product manually, not so easy to stuff up if you use bulk product imports though. Interestingly the fix I eventually found below involved this attribute. In some merchandising situations you want your simple products to be invisible and only show the parent products. However if you do want your product to be visible make sure you set it where applicable in this field. Are any associated products in stock? Are the products in the expected category? 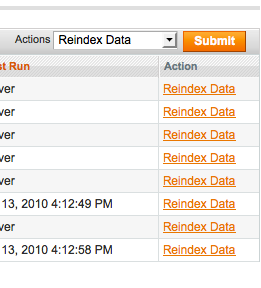 Are your Caches and Indexes out of date? It never hurts to clear/reindex these when you’re scratching your head, it’s getting pretty desperate if you’re still with me to here! Access these options in the System -> Cache Management and System -> Index Management menus. Have you run out of other things to try? And lastly – the weird situation I had yesterday where the products were visible when navigating directly, but not when looking at their category page (and oddly it only affected one category). I suspect this must be to do with an index table not being correct, or a cache, but I tried re-indexing and refreshing the cache to no avail, so I can’t pin it on this for sure. Got through all of these and still no luck? Let me know. Also I’d appreciate any feedback on other tips or suggestions people may have on this, always good to add another possible fix to my list. Had the same problem but only the newly added configurable products won’t show, doesn’t matter which attributset they’re using, if they’re copies of existing ones (status set to active, in stock, everything checked). I am having the same issue – It happens overnight and has happened twice this week. No products show. But then I bulk disable, then enable and they show? Anyone find out why this is happening? i test the search product, but not showing up, i re index the data, now its showing up. thanks. Even my products were not showing up at the front end…but your solution really worked out for me. Good article, have tried all of the above though, and still not showing. Have had products showing fine for around 7 months now. Performed server move around a week ago, products showing fine yesterday, around 48,000 in total, today we have 0 showing in categories. All of the products are still there, and showing at the specific product url. But all categories are empty. 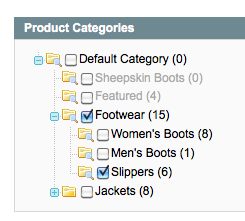 Categories still showing the products within them in backend. Any ideas on how to resolve would be greatly appreciated. The store is http://www.galaxystores.co.uk if you want to view the issue. Thanks. We have manage stock set to NO and status is enabled, visibility set to catalog/search. Most annoyingly I have fixed my products showing in categories, but broken the products displaying at their rewritten url. Fixed products in categories using the magento database repair tool. 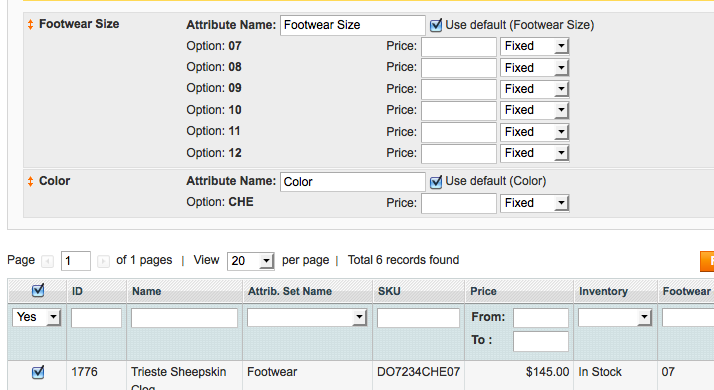 I “think” it was down to corrupt indexes in the table that relates to products being stored in set categories. Anyone any ideas on why products might now not be showing? Have refreshed indexes etc, and tried the full list of concepts online in forums for how to get products displaying. Currently just presenting a 404 page on any product url. Categories and CMS pages display fine. Search also working fine. Most puzzling!! CMS > Page > home page, and then open the Design option and paste these code and save then refresh the frontend page. your product will be showing.. Thanks for your help with this – although none of the ideas here helped me. Im on magento 1.7.0.2. I have recently set up a second website/store running from the same backend. My problem was that some of the products seemed to go into the category on the second site without a problem, others would no show up at all either through URL, Category or search. Others would show up in search and URL, but not category. As most seasoned magento users would know. If you change from the default store view to another view (under product management) – Usually you will find all text entry boxes and options are greyed out – with a checkbox next to each one allowing you to “use default value / config”. In my case, when switching store views on the offending products, I noticed none of these “use default values” were checked. One would think – “Thats not a problem – the settings are fine” – but in actual fact, it is a problem. After I went through and checked all the “use default value” options – everything started to come back to life. -Products displaying in categories and search without issue. Again i must stress – I did this AFTER changing to “Second Website > Second Store > English” – If you know what I mean. I have a feeling this will affect every single product which was created BEFORE I created the new secondary store. Changing them all will be a very laborious task. – YAY. I had same problem and after trying a lot as what went wrong…I finally realized its a minor tab.. Tried this and my product showed up..
I’ve been banging my head against the wall over this for days! I tried all of the above and then came across this stack overflow answer http://stackoverflow.com/questions/10297359/magento-1-5-0-1-configurable-products-attributes-not-showing-in-front-end . I removed the additional jQuery from my js folder, which I’d added a few days ago and BAM! it works but my jQuery stuff didn’t. The offender is Prototype (part of scriptalicious). Hi Folks, Got the same issue happening to a site we just launched. Mr Google doesn’t return a solution this time and all my efforts to retrace the bug are in vain. apart from knowing the client was editing the category descriptions. Thanks so much, you solved my problem. See http://stackoverflow.com/questions/14966117/magento-wont-show-all-products-on-homepage as well. I’ve had this problem, where I used different code that didn’t show all products. This code showed all. Was doing a first time setup, and not seeing my test product on the home page. The missing step was to select a widget which displays products in the Home CMS page. Anyone have any idea why the product information isn’t showing on the back end? When we go in to edit to enable/disable, there is no option. Also, ensure you are not using Custom Layout Updates. I had this problem then realised I was referencing a folder that didn’t exist with the theme I was using.